Enjoy an all request rock n' roll party. Sing-along, laugh-along, drink-along, dance-along and have a good time while 2 of the top piano entertainers in NYC play all your favorites from Billy Joel to Bon Jovi to Britney Spears. Thousands of songs can be played from the 50's to today's current hits with genres ranging from rock n' roll, country, hip-hop, R&B, and much more. With roasts, toasts, games and shot-giveaways, it's great fun for birthday boys, bachelorettes, and groups of 2, 20 or 200. Choose from a customized menu of Mediterranean delights (at own expense). Bar service is available all night long. What began in New Orleans almost a hundred years ago has finally made it's way to New York City! The interactive event that combines a rock concert, a comedy show and a cabaret - it's dueling pianos. No two shows are ever the same because you make it different every night. Come party the night away in our exclusive Times Square show room, with table-side service bringing you the heartiest food, and the tastiest drinks. Celebrating a special occasion in NYC? There's no more unique way to toast your guest of honor that at this one-of-a-kind show. These performers can play almost any song you can think of, and there are prizes all night long for the loudest tables, craziest dancers, and smartest music lovers. 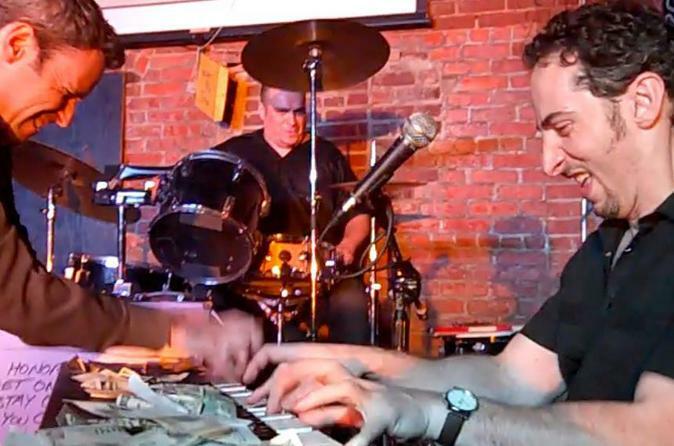 There's no experience in NYC like Shake Rattle & Roll Dueling Pianos.